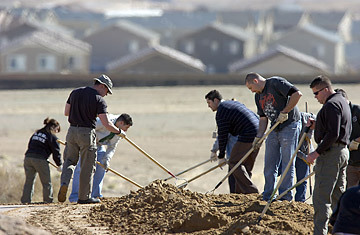 Crime scene investigators use rakes while combing through freshly grated dirt in their continued search for human remains in a large expanse of desert on the west side of Albuquerque, N.M.
After Christine Ross moved into a brand new home on the southwestern fringe of Albuquerque last fall, she and her three-year-old sharpei-labrador mix, Ruca, went for a walk nearly every evening. Usually, they would venture inside a cinderblock wall where the spiny desert scrub had been smoothed over in preparation for a housing development that never materialized. That's where they were walking a month ago when Ruca spotted what to a dog is considered a treasure: a bone jutting from the sandy soil. Ross had an uneasy feeling about the find, however. She snapped a photograph and sent it to her sister, a nurse, who validated her suspicion. Ross called police, who confirmed that it was a human rib. Far from shopping centers and restaurants, the southwestern outskirts of Albuquerque are vast and windswept, with tumbleweeds careering across the barren landscape. Dirt bikers tear up and down sandy hillsides, gleeful that nobody is around to be disturbed by the whine of their engines. Through the years, this isolation has made the area popular for dumping the occasional unwanted body. "We have seen remains on the West Side," said Walsh, "They might be ancient bones or those fallen prey to violence. But this is a first for us, in the number of remains." So far, only four sets of remains have been identified: the 22-year-old mother of the unborn baby and three other women between the ages of 28 and 36. They all disappeared in 2004. The four struggled with addiction and worked as prostitutes  and, according to the police, may have known each other. Given how long ago the women disappeared and that the authorities are finding skeletons rather than complete bodies, police figure the bodies have been there anywhere from five to seven years. Front-end loaders and backhoes roll through the 92-acre housing development, up to 14 hours a day six days a week, tossing dirt into big piles that are then raked by hand. Hampering their job is 15 ft. of fill dirt that was spread across the uneven terrain by the developers to bring it up to subdivision standards, probably a couple of years ago. The last body was found Feb. 27, and investigators continue to seek outside advice, from forensics experts in Iraq to archaeologists. Because the site is too big to comb through every inch, they have employed a variety of detection methods, and compared satellite imagery from 2004 to present-day imagery to determine disturbance in the topography. "We won't stop until we have exhausted all reasonable means," said Paul Feist, commander of the Albuquerque Police Department's Crime Lab. Albuquerque Police Chief Ray Schultz said a piece of evidence is uncovered every day. "It may be as small as one vertebra to an ulna or radial bone," he said. Given the possibility that the victims may all have been female prostitutes, a task force of 40 police detectives has begun reviewing a list of women reported missing since the mid-1990s, along with missing women outside of Albuquerque. In an ironic twist, it turns out that Ross has a connection to two of the four women identified so far. Her younger sister went to high school with one and her teenage daughter is in dance class with the other woman's daughter. Says Ross: "I keep thinking about it over and over and I just can't believe all that time we were walking on top of the girls, I'm just glad they're home now." See the Cults that Went Wacko. See a story about the Green River Killer.